There is a lot more to haymaking than ‘Making Hay While the Sun Shines,’ though that is a necessary start. Sadly, each year, horse barns and farmers storage barns burn down, horses become sick from respiratory disease and colic and a myriad of other diseases such as Cushings. Many of these situations are avoidable, so here are, in my opinion, “The Seven Deadly Sins of Horse Hay Making,” in no particular order. Baling hay that shows a moisture content of over 14% can be a recipe for disaster and is not recommended. Once hay is cut, it will ‘sweat up’ for approximately two to three weeks. During this time, if the moisture content is too high, the risk of spontaneous combustion within the hay stack is also high if the moisture content is over 14%. There are lots of tools to help you ascertain the exact percentage of moisture in your hay including hay wands and moisture testers. Some balers even read every bale as they go through the machine. Yes, farmers are becoming high tech each year. If you have a worry that your stack is becoming too hot, then contact your Fire Department. Never try and take apart a hay stack that is in a combustion state however ‘mild’ it may appear without professional help. Opening up the stack that is suspected by smell or heat measurement of combustion being imminent can cause a blow up as oxygen hits the fire or the gases that build up inside the stack. Hay that is baled with too much moisture will also ‘dust’. We all know the real hazards to horses of dusts and molds in hay. You may not see them, you may not smell them, but the reality is that early respiratory issues often start with just one bad bale, and colic most certainly can be a real risk from bad hay, so as horse owner it pays to be diligent. You can buy out of the wagons and will usually receive a discount from the farmer for doing this, as it saves double handling. Just be sure to check the moisture and follow the storage rules below. And remember, always make a change in hay slowly with your horses to avoid colic. Newly cut hay is going to be much richer than last years cut, and if it comes from a different source/field will also have a different make up to the previous hay you have fed. The digestive system of a horse needs time to adjust to changes whether it be grain or hay, so be sure to add just a little bit of new with the old and switch over slowly. I try and store the hay two or three weeks to cure before feeding. In order to cure hay there are at least twenty different preservatives that can be added to the hay at time of baling and cutting by the farmer. Most of these have been tested for safety with cattle, but may or may not have been tested on horses. There is some evidence to suggest that certain preservatives, while all are undetectable to the eye or nose, may cause respiratory inflammation in horses of all ages. As your horse spends hours with his nose in hay for much of the year, it is not surprising that he might be affected in this manner. We ask a lot of our performance horses and this is an area of concern and long term health too, as young horses are particularly susceptible. Why do farmers add these products? Simply put, it saves time waiting for Mother Nature to dry the hay, will reduce dust in the hay which will result as hay ‘sweats up’ then cools down if it baled with too much moisture. It also allows farmers to bale with more water content in the hay, which means if they sell by the ton they will receive a higher price. I cannot tell you how many hay dealers have come and checked our hay and told us, we want these bales bigger, weighing seventy pounds. Well that weight would be from water, and we know that we would have to add chemicals to do this. So we won’t. But just be aware when you are buying hay, it is not all about the weight. Farmers receive a higher price for 2nd cut hay. This is because it is higher in protein. The grass is often softer too depending on the types of grass. It is important that you check the quality of hay you use in your horse’s diet by core sampling and sending out for testing so you know what its protein content is and value to your horse’s overall nutrition. Too much protein is not necessarily good for horses, while for dairy cows it is beneficial. The high nitrogen can cause colic, the high protein and sugar content can cause and aggravate Cushings. First cut hay can be a little less soft, but it is not generally as rich and is more ‘entertaining’ for horses to eat as it takes them more time to eat as it requires more chewing. Personally, unless it is a thoroughbred mare in foal or a high performance thoroughbred cross, I rarely use second cut for horses. I will use it as a supplement, but not as a main dietary source. See notes below for special circumstances for underweight/ill/rescue horses. Hay needs air circulating to keep it healthy. Store it with string side on the vertical to facilitate good drainage of any moisture to the bottom bales on the stack. We always sell the bottom of the stack out for mulch hay and never feed it, but then depends on turnover and storage conditions. If you store on a concrete floor, moisture will aspirate off the concrete up into the stack, so avoid that. Add a layer of tarp and shavings on top to prevent this. Leave a minimum of half inch gap between and around every bale on the layer. Criss cross the stack, i.e. one layer all in one direction, the other layer in the other direction and repeat. Again, this improves air flow and improves safety of the stack and hopefully prevents it from tumbling down. If you have a hay mall, then do whatever you can to increase air circulation and obviously no roof leaks allowed. Throwing a tarp on top of the hay just under the leak will not eliminate water and will allow water entry/run off onto another part of the stack and moisture will in any event be present in the building. Probably the very worst way to store hay is in a steel container. You are adding moisture from the repeated condensation of the metal sides and roof and floor of the steel container. If your feed merchant uses this method, beware. The front doors may be open but it won’t be enough to help maintain hay quality. Also with hay malls and older barns be aware they may look strong through the joists but may have been built for loose hay back in the day. Stacking hay that is baled is much, much heavier. The small squares are naturally much easier to handle, maybe a little more expensive because there is so much more labor required, but overall it’s probably a better choice, in my opinion. Round bales are hard to handle in the barn, though they can be easily taken to the field with a tractor with the right fork or blade and are often used for outside feeding. The wastage factor is high. 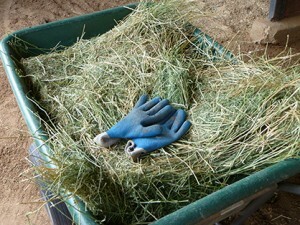 Both because the outside 1/3rd to 1/2 of the round bale may be poor feeding for horses due to water, mold, fungus etc. and because the horses will trample it as they pull it out the feeder. Be careful of cattle feeders. Foals can get legs and heads caught in them, even adult horses can put their hoof through and get caught. Check the design carefully. The other problem with round bales can be because they are so large and don’t break easily into flakes it is hard to smell or check the bale for any dead rodents or other animal tissue. This poses a real risk of botulism to your horse. When you cut a field of hay you might run over a fawn, rabbits, birds, snakes, rodents and a myriad of other critters. While turkey buzzards, coyotes and foxes may be around to pick off the dead matter from the windrows, round bales are often baled with much larger windrows, which means the dead animal parts may not be seen and pulled out before baling. They most certainly won’t smell significantly enough for detection for a handler to notice, if baled in the center of a round bale. When small bales are handled individually, they go through many hands. The farmer and his help will notice an off smelling bale and discard it. If you or your help pull small bales apart to feed, the flakes will fall and separate ( or should do if it is good hay properly cured), and you will soon detect any poor smell or visual surprises. The risks of large rounds is the same for the larger square bales. Hay that gets wet on the field may be dried and baled and many farmers do this. The nutrition of the hay will be diminished to some extent which will make it a poorer product though these bales are still very suitable for cattle and pig feeding. The color of the hay will not be as green, and may be quite brown. Personally, we never bale hay that gets wet for use with our horses; we simply mulch it back in. This does not mean that it is a bad thing to do, it is just we don’t want to use an inferior product for our horses. For highest ‘sweetness’ the perfect time to cut hay is around 10 a.m. If you don’t want the sugars up in the stalk, then you cut it late in the day. This may be relevant if you run a horse rescue and have horses that are not used to richness in hay where it might make them sick, or for horses suffering from Cushings or other metabolic disorders. Just as when you shop for your own food, you hopefully are aware of its provenance as much as possible, it pays to apply the same rule for your horse hay. If your hay dealer delivers you weedy hay, hay that is brown, hay that is dusty, hay that is of poor quality in general, then find another source. There are many types of grasses, timothy, orchard etc. clovers, and legume grasses such as alfalfa and more. That is a topic for a whole article. Generally, a mixed grass bale will work best for most horses. A high performance racehorse may benefit from alfalfa or mixed alfalfa. Baling and cutting alfalfa is a whole other topic too. The Horse Studio Team and The Merry Band at Catskill Horse hope this article has helped you with your horses’ hay. There are a lot of resources out there to further advise you and with the internet many options for supply. Just remember, if you are throwing hay away because of poor quality, you will not be saving money because you found a cheap product price. Find a good source and stick with it. A farmer values regular customers and it is a win/win situation as he will always supply his regular customers as a priority in times of shortage.